Bitter rivalry, begrudging respect and enthralling match-ups characterise Manchester United versus Liverpool contests. But is there a more compelling duel than the one between United's David de Gea and Liverpool's Alisson - the two goalkeepers who shine brightest when it comes to preventing goals in the Premier League? One has gone from loving "fizzy drinks and biscuits" to a Premier League title contender and the other is strolling around training as "the calmest man in town". Before a resurgent United host Premier League title chasers Liverpool on Sunday, BBC Sport looks at how two of the world's top keepers honed their craft and asks just who is better? When Alisson, 26, arrived at Liverpool in July 2018 from Roma in a deal worth up to £66.8m, he temporarily became the world's most expensive goalkeeper. Moving to England from abroad, learning a new language and integrating into a new culture is hardly the easiest backdrop to finding your form. Time, effort and rudimentary training sessions have been central to Alisson's impressive start at Liverpool, meaning their Melwood training base has, at times, resembled an England rugby union practice session to prepare him for buffeting encounters with Premier League strikers. "We have used rugby bags with Alisson," Liverpool goalkeeping coach John Achterberg told BBC Sport. "We wanted to be sure he was clear about and mentally ready to deal with that physical challenge. "You might not be aggressive as a person but you have to be on a pitch to deal with situations. It doesn't happen every game but you have to create that movement, body position, and attitude to deal with it, like bouncing a player away. "In the past, we had a defender in between the striker and goalkeeper. We haven't now. Alisson deals with the player himself." The Brazilian has been far from infallible though. Errors at Leicester in August and against United in December were punished - two of four such mistakes that have led to goals, according to Opta. "We talk to him about it [mistakes] but you don't speak negatively because you have to prepare him mentally for the next game," Achterberg added. "He knows he made a mistake, I know it, the whole world knows it. It's highlighted in the press, on social media and everyone tries to be negative. Being able to forget mistakes is the thing that allows you to play at the top. If you do the next thing wrong and the thing after, it kills the team." With his imposing 6ft 3ins frame, Alisson's physique is very different from how it was as a junior in Porto Alegre with Brazilian Serie A club Internacional. After abandoning attempts to play on the left wing, his progress as a goalkeeper at the Beira-Rio Stadium was initially hampered by his "smaller and chubbier" frame. "He was technically very good but he was small for a goalkeeper and loved soft drinks and biscuits," said Internacional goalkeeper coach Daniel Pavan, who worked with Alisson for eight years. "At 15-16 years of age, he grew about five to six inches taller. From there he was playing more regularly and was capped by Brazil (at under-17 level), which helped get him started." While Alisson may be establishing himself as one of the Premier League's top goalkeepers, De Gea's credentials are long-standing. Featuring in the PFA's Premier League team of the year in five of the past six seasons, he is also the first person to become United's player of the year on four occasions. His start was hardly convincing, though. Arriving in Manchester as a 20-year-old from Atletico Madrid in 2011 for £18.6m, his slight figure - and his unfamiliarity with the English game - made him a target for opposition players at set-pieces. Facing Rory Delap's long throws against Stoke was something of a culture shock. "It wasn't easy for him," said the club's former goalkeeping coach Eric Steele. "He had never seen someone like Rory Delap in his life. You don't get those long throws in Spain and he didn't know the Premier League then. "We worked on familiarising him with opponents. So against Arsenal it was about preparing for plenty of cut-backs and shots through bodies, whereas at Stoke it was about how to come and catch or punch the ball." 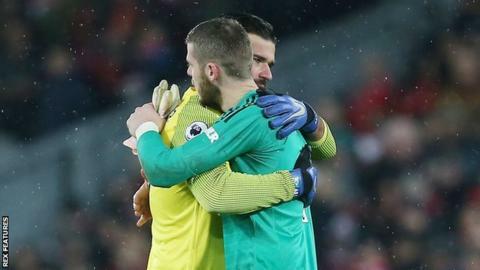 Steele stressed that De Gea's personality is another key attribute that sets him apart from his contemporaries and helped him overcome early problems. And it is something that has been integral to Premier League, FA Cup, EFL Cup and Europa League triumphs as well as a resurgence in form this term characterised by his display at Tottenham in January. "David is the calmest man in town," Steele added. "He is on the training ground and he takes that calmness into matches, which helps his team-mates. He has shown repeatedly he can make saves that are the difference between winning and losing matches. "We were looking at how he could create a difference and then engage in the different thirds of the pitch. The club had that with Peter Schmeichel and Edwin van der Sar in the past." Alison is top of the charts this season when it comes to clean sheets. With 14 from 26 appearances, he has two more than nearest rival Ederson, at Manchester City, and eight more than De Gea this term. Only France and Tottenham captain Hugo Lloris has a better save percentage ratio (78%) than Alisson's 77%, with De Gea the next best on 73%. In 2015-16, Kasper Schmeichel had a save percentage of 73% as Leicester won the Premier League, while Chelsea's Thibaut Courtois and City's Ederson managed 71% and 68% as their clubs finished in top spot in the next two years. Alisson's percentage currently surpasses all of those and compares favourably to De Gea's when United claimed their 20th league title in 2012-13. 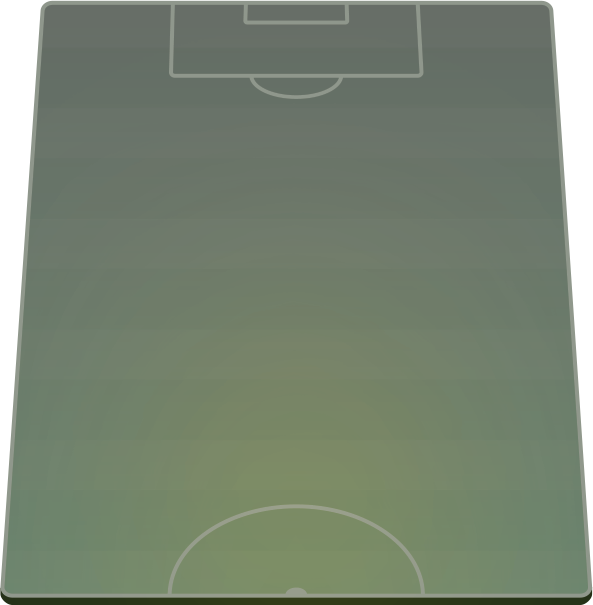 That season, the Spain international kept 11 clean sheets with a save percentage ratio of 76%. However, unlike De Gea, who kept 18 clean sheets last season, Alisson has also benefited from operating behind a largely settled Liverpool defence. Klopp utilised just five players in his back four until October, keeping four clean sheets in the process, while United deployed 10 different players in the same period, managing just one defensive shut-out. Alisson is also edging ahead of De Gea on Opta's Expected Goals on Target model (xGoT), which shows how many goals a team should have conceded compared with their actual total. De Gea was comfortably the best in the division last season, stopping 14 efforts that should have resulted in goals. This season, the United keeper has faced 36 efforts that should have brought goals, conceding 33 times. Alisson has faced 20 efforts of that quality, conceding 15 goals. Tottenham's Hugo Lloris is the only keeper with a better ratio, saving eight certain goals. Who would get into your team? So they're both excellent keepers, but if you had to choose, which one would make your starting XI? For former Liverpool and England defender Stephen Warnock, De Gea edges it. "If Liverpool were to win the title this year, you could say that Alisson has done exactly what they bought him for," he said. "But is he better than De Gea? At this moment, I would have to say no." You can make your choice but selecting your own combined Manchester United and Liverpool XI using our tool below.